Packaging is one of the keen factors to consider while processing the product. Self-Adhesive Rolls plays an important role in the packaging of the product. Packaging is the way to attract the customers. It is speedy and efficient that is available for labeling for different shapes and size and finished the product. Different type of materials are available that includes polyester and direct thermal label, polythene, semi-gloss surface, matt white and many more depending on the requirement. Food and Beverage Industry – Nowadays, food industries are growing exponentially and so is the increase of demand of the self-adhesive rolls. In the food industry it is been used for different food products like tomato ketchup, ready to eat sauce, salad dressings etc. Labeling adds quality to your product also meeting freezing and the storage conditions of the product. 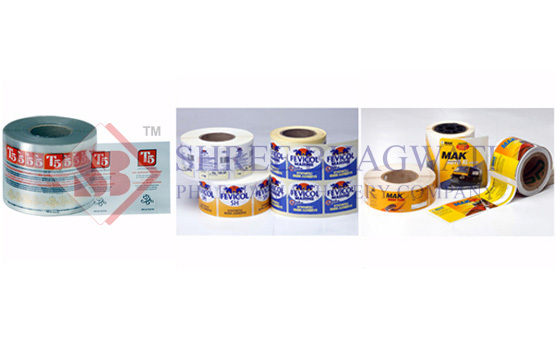 Retail Products Industry – In this type of industries self-adhesive label rolls in order of point of sale and promotion. Different products like glass, bowl, showcase piece etc. use self-adhesive label role for permanent pricing and product information labeling. Personal & Household Care Product – Nowadays, everyone is aware of the cosmetic and household products they buy. So, it is now become important to have the labels with correct information about the product. These self-adhesive label rolls are used in products like perfume, lotion, conditioner, shampoo, creams, gels, and many more products. Office & Stationary Supplies – Products like papers, books, decorative items comes under office & stationery supply. In this type, mostly removable adhesive stickers are been used. Its label has a special gloss and metallic effect that adds a quality to the marketing of the product. Pharmaceutical Industry – In this industry, self-adhesive labels are been used that meets the industrial guidelines. They should meet for certain conditions like it should be biodegradable and non – toxic. The labeling is available for different size and shape of the product. Various features include highly adhesive, water-resistant and perfect finish. Shree Bhagwati Labeling is the manufacturer of the designs of the self-adhesive labels for different industries as mentioned above. We provide with the different type of material of self-adhesive rolls that are highly durable and long lasting. We offer to label for different shapes and size with the help of thermal transfer printers that are operated at a specific temperature range that are also applicable to barcode labeling. Other than self-adhesive label rolls we offer with different labeling solutions that include different types of sticker labeling machine like the vial, bottle, ampoules, single sided, top-sided as well as top labeling machine. We also provide with shrink sleeve applicator as well as induction cap sealing machine.